The game sheet shows that a Rushmore team from Rapid City scored 11:43 into the third overtime to end the marathon quarterfinal and end Edina’s season at the USA Hockey 2018 High School National Championships. While the participants quickly moved on – the South Dakotans to a semifinal tilt just a few hours later and the Minnesotans to enjoy Spring Break – one man and his girlfriend – more on her later – remained. Not only did he stick around to watch that night’s semifinal suddenly missing his team, Coach Bill Smith bounced back early the next morning to see the championship game. The obvious question is why. A 1960 graduate of Edina High School and longtime resident of the community, Smith played goalie for a few years in an outdoor adult league after finishing high school. 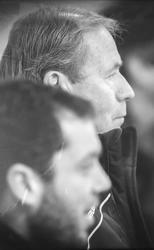 He coached youth teams for a spell, until his son settled on skiing as his preferred cold weather activity. With winter not conducive for his golf habit – he used to play as many as 140 rounds a year – Smith’s passion for hockey brought him back. He was slotted to go behind the bench for an Edina Bantam team when the association president asked him one night to stick around to lead a tryout for a new team with no coach. Thinking his good deed was done, he came off the ice and was met with a subsequent inquiry: “What are you doing tomorrow?” Impressed by what he saw in the two skates, he offered to swap the Bantams for the older kids. Nearly 30 years later, he has ascended to legendary status in Edina. Induction as an inaugural member of the Association’s hall of fame Cornerstone Wall serves as proof. 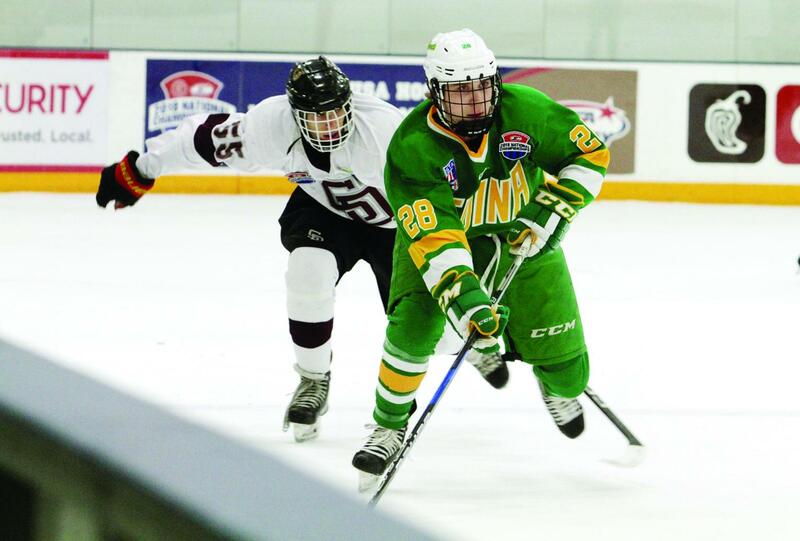 Hockey for the state’s high school age players outside of the varsity level has taken many forms over the years, but always falls under Minnesota Hockey and USA Hockey jurisdiction. Today, there are 72 teams statewide, but only 11 (down from around 25) competing at the highest division – Junior Gold A. Edina has won seven state championships with Smith at the helm. Just how good is the level? One of Smith’s former players, Adam Carlson, used Junior Gold as a springboard to the NAHL, NCAA Division I and now professional hockey as a goaltender in the minors for the Washington Capitals organization. Others have gone on to play NCAA Division III. Those closest to Smith have been supportive every step of the way. During a resurface break between overtime periods of the quarterfinal, a visibly stressed lady was asked which player was her son. “I don’t have a son playing,” she said. “My dad’s the Edina coach!” It was his daughter, Gena, who follows her dad’s teams and often attends games, recognizing what a huge part of her father’s life this is. Another ever-present sidekick is Jeanne, his girlfriend of 22 years. Initially drawn to the man with a disarming smile and jovial demeanor to match, she could not have envisioned how much time the two would spend at the rink. Fortunately, that hasn’t been a problem. “I really enjoy it. It’s our wintertime event,” she says. A new challenge materialized in 2010 with the advent of a High School division for USA Hockey Nationals. New England Prep schools and teams in the Minnesota State High School League are not eligible, but most of the U.S. sends teams. Throughout the Sun Belt, these teams compete in competitive leagues organized by local NHL teams. It took a while for Minnesota to send an eligible Junior Gold team, but in 2015, Edina accepted that challenge after an epic seven-overtime win over Wayzata in a game stretching over two days due to a power outage. Shortly after that victory, the team boarded a bus for St. Louis and performed well, succumbing to California’s Santa Margarita in the semifinals. 2016 was a strange year, with Edina becoming state champion by again defeating runner-up Wayzata – this time in five overtimes. Both moved on to the national tournament – Wayzata by accepting an at-large invitation – and the two met for a rematch in the National Championship game. Smith’s team was moments from glory before a tying score with the goalie pulled forced overtime. While the resulting loss to Wayzata still stings, it serves as a reminder that a Junior Gold team can win this event. No Minnesota teams attended in 2017 due to conflicting dates with Spring Break. Wayzata received a berth this year as host association and Edina qualified for its third Nationals appearance as state champion. Vacations again posed a problem, as some players available when the tournament began on Thursday were gone by the weekend. “I know we would have won the quarterfinal game with them,” Smith says. A joke amongst friends is that the answer committing to “one more year” hasn’t changed when Bill is asked if he’ll continue coaching. He says what keeps him going is “the interaction with the kids at an age where they grow up and mature into adults.” He’ll spend time this summer at his farm near Rockford, and at this point his life is divided into two parts: hockey season and waiting for hockey season. “I can’t wait ‘til fall!” he beams, knowing that Edina is stocked players for another successful run. Additionally, there’s no conflict between the school’s Spring Break and the 2019 USA Hockey High School Nationals. He’s checked. “The only thing we haven’t accomplished with this program is the National Championship.” He obviously hopes to change that, a point clear to those that saw him watch the 2018 semifinal and championship games. There is another milestone on the not-too-distant horizon. Several of his former players have settled in Edina and have children playing. Fit at age 75, it isn’t a stretch to think he’ll remain at the helm long enough to have a second-generation player on his team.